On December 26th, 2004, a wall of water as high as 30 feet crashed into shorelines along the Indian Ocean from Africa to Australia washing away whole coastal towns and villages. With a death toll of more than 200,000, it is perhaps the largest natural disaster in the history of man. What caused these huge waves and where will they strike next? It was early in the morning, almost 2:18a.m., on April 1st, 1946 at the Scotch Cap Lighthouse on Unimak Island, Alaska. The five men that were on duty inside the five-story building that stood on a bluff some 40 feet above the sea were nervous. An earthquake had occurred less than an hour ago, shaking the station violently for thirty seconds. Twenty-seven minutes later a short, hard aftershock occurred. 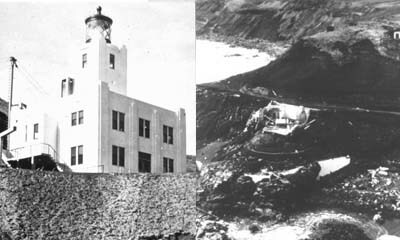 The officer on watch at the lighthouse that night, Leonard Pickering, was trying to get news about the quake from Dutch Harbor navy radio. Perhaps as he did so he looked out the window and pondered why the ocean was so amazingly low. So low that the sea bed was exposed. Perhaps he didn't. We will never know for sure. What we do know is that a few minutes later the sea returned in a violent rush. Waves climbed up the 40-foot bluff and engulfed the lighthouse. The water was so high that it would have topped the tip of the light, if it had still been there. As it was, the building probably collapsed when the wavefront hit it, killing all five men inside. When rescuers from a nearby coast guard station reached the site early the next morning, they found the area covered with debris. Only the foundation of the structure still stood to attest that the lighthouse had ever existed. As for the crew, the rescuers that day found only an amputated human foot, a kneecap, and bit of human intestines. 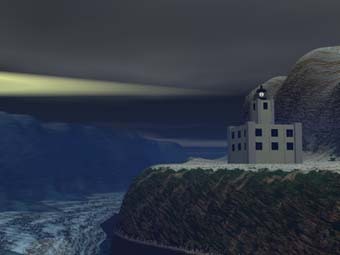 The Scotch Cap Lighthouse and its keepers were the victims of a tsunami (tsoo-nah-mee), a series of violent waves that can rush into coastal locations and sweep away cars, level buildings and kill people. Typically, a tsunami can reach a height of 30 feet above sea level, but in some extreme cases, as at the Scotch Light, they can reach heights of over one-hundred feet. 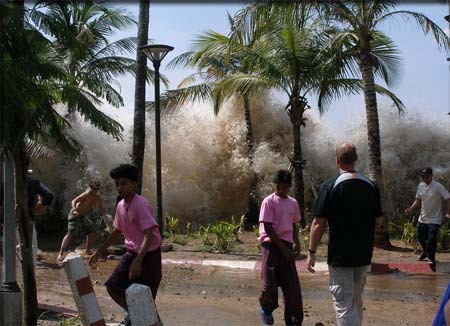 The most deadly tsunamis are the result of earthquakes. The sudden movement of the earth can raise or lower a vast portion of the ocean bottom by as much as ten feet in just a few minutes. When the sea bottom goes up, the column of water piled on top of it is also pushed up, creating a bulge in the surface of the ocean. As this mass of water spreads out, a series of waves are created that fan out from the earthquake area. These waves make up the tsunami. The word tsunami is Japanese for "harbor wave." Sometimes the English term tidal wave is used, but it is misleading as a tsunami has little to do with the tides. They are also, in most respects, unlike normal ocean waves. A typical ocean wave is caused by wind sweeping across the water. These waves may appear large when driven by a storm, but they only involve the top few feet of the ocean. Normal ocean waves also have a short "wave-length" (the distance from wave crest to wave crest) that is usually less than a hundred feet. In contrast, tsunamis involve the entire water column from seabed to surface. Their wave lengths are also very long, maybe as much as a hundred miles. Because there is so much water moving in the tsunami, the energy involved is tremendous. Despite this, a tsunami is practically invisible in deep water. To a ship at sea it may appear as a rapidly-moving three-foot-high swell that is easily lost among the normal ocean waves. Only as it approaches the beach does its true size become apparent. The waves in a tsunami move very rapidly through deep water reaching speeds of 500 miles per hour. As wave approaches land the water grows increasingly shallow and friction with the ocean bottom slows the wave. As other waves back up behind it, the wavelength shortens and the top of the wave height increases until it may be ten, twenty, thirty feet, or higher. The actual height of a tsunami wave is hard to measure without risking life and limb, so scientists usually gauge their size by a term called the run up. This is the maximum vertical height above sea level that the water reaches on the coast. In the case of Scotch Cap the run up was measured at over 100 feet. The amount of damage done by the waves will vary widely depending not only on the size of the wave, but the configuration of the shoreline and the sea bottom. In the 2004 Indian Ocean tsunami, the Maldive Islands suffered tremendous damage, while just a little to the south the island of Diego Garcia had very minor damage because it was protected by an offshore underwater canyon. Even after being slowed by the shallow bottom as they approach land, tsunami waves still move faster than any human being can run, often with velocities of 45 miles per hour or more. As one scientist observed "by the time you see a tsunami approaching, it is too late to get away." This graphic represents the propagation of the wave from the original earthquake across the Indian Ocean in the 2004 event. Because it is too late to escape a tsunami by the time you see it, tsunami warning systems are extremely important. The deadly 1946 tsunami that destroyed Scott Cap Light station and also ravaged much of Hawaii caused the United States to set up the Pacific Tsunami Warning System (PTWS) in 1948. At the headquarters in Ewa Beach, Hawaii, staff members monitor seismographic information from around the world. If an earthquake occurs, they combine the information from several seismograph stations at different locations to get the position of the quake. If the quake occurs below the sea floor and it is strong enough (7.5 or higher on the Richter scale), it may have generated a tsunami and a Tsunami Watch may be issued. The center also operates a number of deep sea buoys that are connected to sensors on the bottom of the sea. By measuring pressure, the sensors can tell the height of the water above them to within less than a half an inch. If the sensor detects the passage of a wave that looks like a tsunami, it contacts the buoy which in turn sends a signal via satellite to the PTWS. Confirmation of a tsunami is also made by getting reports from each coastal location along the wave's route as it arrives there. Once a tsunami is confirmed, a warning is issued to affected areas. Since the PTWS was set up, it has warned the public about several significant tsunami events and saved hundreds of lives. Unfortunately, because the Indian Ocean had not had a major tsunami event in many years, no warning system was in place in there in December 2004 when the tsunami struck and the result was a huge loss of life. Tsunami, Tidal Wave, Tidal Bore or Rogue Wave: What's the Difference? A tsunami is a large wave produced by the vertical movement of the sea floor, a meteor strike or a landslide. While the term tidal wave has been used interchangeably with tsunami, a tidal wave is more properly synonmous with a tidal bore. A tidal bore is created in a river when a rapidly-moving tide is slowed by friction with the river bottom and the water builds up into a large breaking wave. Tidal bores are fairly predictable events as they occur at particular locations at particular times. Occasionally, though, they surprise observers as happened with some students who went to see a bore in the Qiantangjiang River in China in 2002. They found running for their lives as it unexpectedly topped the sea wall and chased them down the street. A rogue wave occurs during heavy storms when two or more normal ocean waves created by strong storm winds meet and reinforce each other, giving the combined wave an exceptional height. These waves can grow as tall as 90 feet and present a danger to even the largest ships that cross their paths. Even without a tsunami warning system there are some signs that may warn coastal residents of an impending tsunami. It is prudent to always evacuate a coastal area after a strong earthquake. If the sea suddenly recedes and the seabed is exposed, this may also be a warning that a tsunami is on the way. Unfortunately in the past, events such a sudden drop in the sea level has drawn the curious down to the beach, increasing the casualties when the actual waves arrived. Needless deaths have also occurred when victims failed to realize that a tsunami can be made up of multiple waves and the first one to arrive often isn't the biggest. The curious can wander down to the oceanfront to see the damage by the first wave and be killed when the next wave arrives a few minutes later. The regions most likely to be affected by a tsunami are those which are seismically active. The Pacific Ocean, where two continental plates meet, is notorious for the creation of tsunamis. Here, in what scientists call a subduction zone, the Pacific Ocean plate is sliding under the North American plate. When they move, the grinding between the plates creates shock waves that run through the rock. We interpret these as an earthquake. If the earthquake raises or lowers the seabed, a tsunami is likely to result. The December 26th, 2004 disaster involved the Indian plate and the Burma plate near Sumatra. Previously, this area under the Indian Ocean has been quiet and no significant tsunamis had occurred there in many years. This has scientists wondering if other places not traditionally associated with tsunamis might be under threat. New York City Under Eighty Foot Waves? While the continental United States has been spared tsunamis in recent years, anywhere along the Pacific coast might be vulnerable. In 1964, Crescent City in northern California was hit by a tsunami generated by an earthquake near Valdez, Alaska. The four waves associated with that tsunami washed away 29 city blocks and killed 11 people. The Atlantic coast of North America has seen fewer and smaller tsunamis, but there is still a chance that a major one could occur. In 1929 a giant wave hit Newfoundland, Canada, killing 50 people. Scientists are also concerned that a fault zone in the Caribbean might generate a wave that would run up the United States east coast. Subduction zones are the most frequent, but not the only cause, of tsunamis. A submarine landslide, a large meteor hitting the ocean or volcanic action can all cause tsunamis. Some scientists are concerned about a volcano on the Canary Islands in the Atlantic near Africa. A 2001 study predicted that aneruption there could cause a gigantic landslide (a rock about the size of Manhattan) that would end up in the ocean and most likely cause a large tsunami. Computer models run by the scientists show that such a wave could cross the Atlantic in nine hours and engulf the east coast (including New York City) with 80 foot waves. A more recent 2012 study, however, indicates that such a nightmare scenario might only happen far in the future when the volcano has grown another half mile in height. Smaller slides creating 10 to 15 foot waves along the U.S. shore are more likely. Even so, as the disaster along the Indian Ocean has shown us, mankind needs to take the steps necessary to prepare for these big waves. Failing to do so can have catastrophic results. Waves of Destruction by Tim Folger, Discover Magazine, May 1994.